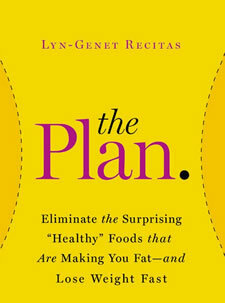 The Plan is a New York Times bestselling book that reveals a surprising reason why many people struggle to lose weight. It may have to do with allergic like reactions to some of the healthy foods that are common in traditional weight loss diets. Once you identify these foods and eliminate them from your eating plan you will naturally lose weight without counting calories. Nutrition expert Lyn-Genet Recitas explains that each person has a unique body chemistry. In The Plan she outlines a 20-day program that will help you unlock the mystery behind your body’s responses. While a food may be healthy for one person it can actually have a toxic effect for another. The Plan helps you identify the hidden trigger foods. These foods can cause weight gain, inflammation and premature aging. The Plan starts with a detox diet to give your body a break from digesting reactive and processed foods. This decreases inflammation and acts like a reset button to create a baseline from which you can test new foods. One-by-one you will test your tolerance for different foods. For each day of the twenty-day program you are given a menu plan with information about the foods being introduced that day. If you have a negative reaction to a food then you should continue to avoid it. The plan doesn’t end after twenty days. You are encouraged to continue the testing process on your own. The goal is to discover about forty or fifty foods that are friendly to your body. It is necessary to ensure you find a wide variety of foods you can tolerate to prevent dietary boredom and provide adequate nutrition. This phase also includes guidelines to help you plan your own meals and daily menus. Once you have been through the testing process you have the opportunity to customize the program to suit your lifestyle. For example, you might follow the plan during the week then allow yourself to indulge on weekends. Or you can start with a cleanse day every Monday because it sets you up to make healthy choices during the week. The Plan encourages you to do what works for you and to use your scale to make sure you stay on track. Flax granola, pumpkin seeds, sunflower seeds, chia seeds, almonds, blueberries, apples, mango, kale, spinach, snow peas, broccoli, carrots, avocado, beef, lamb, venison, duck, wild fish, scallops, goat cheese, homemade hummus, pinto beans, rice, dark chocolate, coconut milk, extra virgin olive oil. The Plan says you should not work out for the first three days because it is best to rest while your body is cleansing. After that you should restrict your exercise to no more than four times per week. This is because studies show that any more than this slows weight loss by 25 percent. You can choose to do 30 minutes of cardio, light weight training or yoga. The Plan: Eliminate the Surprising “Healthy” Foods That Are Making You Fat–and Lose Weight Fast retails at $25.99. Click here to purchase The Plan for a discounted price. The even cheaper Kindle version can be downloaded here. Can help to identify hidden reactions or allergies to foods that may be negatively impacting on health and weight loss. Recommends the consumption of fresh, unprocessed and organic foods. Encourages dieters to broaden the variety of foods they are consuming. The Plan provides a twenty-day meal plan and recipes. Includes a menu plan specifically designed for dieters with thyroid issues. Meal plan is fairly complicated and requires extra time for food preparation. Menus must be followed exactly for the first twenty days with no substitutions allowed. Most dieters will experience detox symptoms during the cleanse phase such as headaches, muscle aches, digestive disturbances. Requires the use of several nutritional supplements. Eating out isn’t allowed until day eighteen of the plan. Flax granola is likely to cause digestive problems for many dieters. The Plan can reveal negative reactions or allergies to foods that may be a hidden cause of weight and health issues. Once you identify your “friendly foods” and make them the foundation of your diet it becomes easy to lose weight.